Netanyahu and Deri get first-hand impression of the situation in southern Tel Aviv, which is dealing with illegal infiltrators. 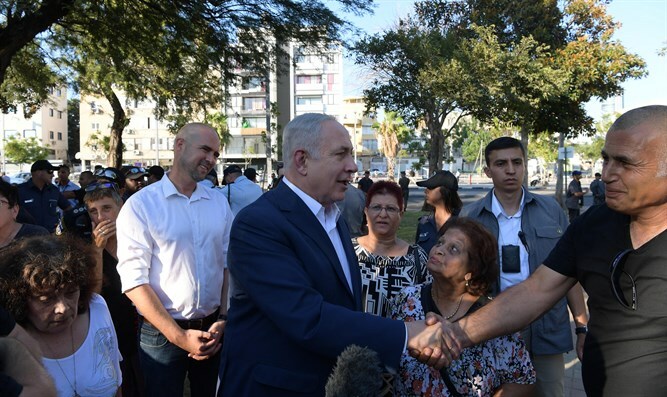 Prime Minister Binyamin Netanyahu and Interior Minister Aryeh Deri held an unannounced tour of southern Tel Aviv on Sunday evening, in order to get a first-hand impression of what was happening in the neighborhoods there. The visit took place in the same areas which Netanyahu toured last Thursday - Neve Sha'anan, Levinsky Park and the Hatikva neighborhood. Southern Tel Aviv has been suffering from years from the problem of illegal infiltrators, mostly from Eritrea and Sudan, who move into the neighborhoods, frightening the local residents and causing the crime rate to skyrocket. Last week, the Supreme Court ruled that illegal infiltrators cannot be detained indefinitely for refusing to be voluntarily deported. Netanyahu promised to set up a ministerial committee to resolve the situation, which is set to hold its first meeting this coming Thursday. Speaking during Sunday evening's visit, Deri said, "This was an important tour that helped us to study the entire issue of infiltrators in the southern neighborhoods of Tel Aviv and help us in our efforts to solve the problem." Earlier on Sunday, Netanyahu referred at the beginning of the Cabinet meeting to the illegal infiltrators in southern Tel Aviv and promised to act to evict the illegal infiltrators from the area. “I emphasize that this is the problem, these are not refugees, only a tiny proportion are refugees, these are illegal infiltrators in search of work in the state of Israel and we have the right like any country to supervise our borders and to remove from our borders anyone who is present here illegally," he stressed.